This recipe was passed on to us from my husband’s grandmother, who sent us care packages of her special Pumpkin Cookies every Halloween. Mammie used Crisco Oil and it made her cookies very moist and last for weeks. 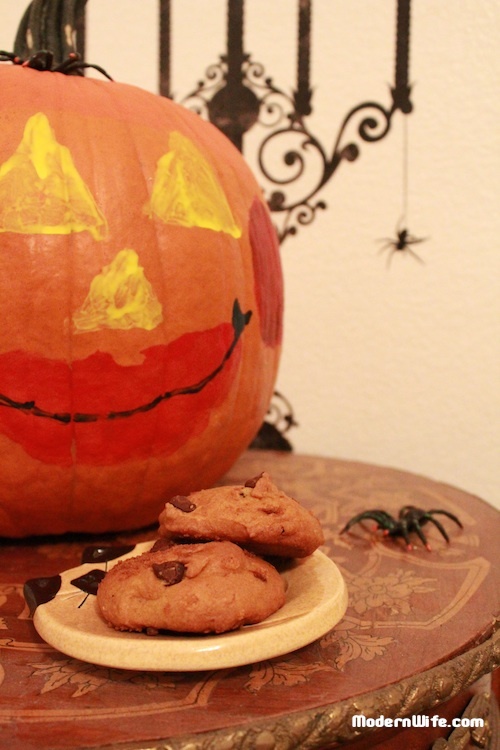 I used organic canola oil as a healthier alternative, and this makes the pumpkin cookies moist, light and fluffy. If you like your cookies crispy on the surface, use butter instead. Preheat oven 375 degrees F. Mix well all ingredients, except flour and chocolate chips. Add flour slowly until smooth. Add chocolate chips and mix. Spoon onto greased cookie sheet and bake for 12 to 15 minutes. 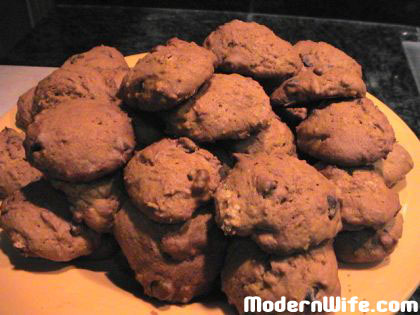 Take the cookies out as soon as they are showing a bit of brown around the outer edges.